This review took a long time coming. But its comprehensive nature makes up for the lag. Thanks Mods for the effort you have put in. I guess it was due to multitude of factors. I have been personally waiting for this ever since I booked the new swift and even more eagerly after taking delivery on the day of launch. Agree with almost everything observed. 1. Ride is a bit harsh. But the gains in handling make up for it. 3. The MID settings are a pain to adjust. 4. It draws attention wherever it goes. 5. My regular drive is a Vento TDI HL. And most of the SA's at my service center are my patients. Still, I find the service experience of maruti is out of the world. Heck, they even came to my home to do the 1 month service free of cost. AT MY HOME!!! When I first saw the pictures of the new Swift it felt like yet another product from Suzuki with a very safe and predictable design language. But after seeing it in person, the opinion has change – though it has lost the tightness and character or the old Swift, it’s not that bad to look at, infact quite a pleasing little number. Considering Suzuki’s penchant for high-sales models I don’t expect the wonderful Swift Sport to get launched in India. Or will there be a Toyota Swift Sport? Coming to the car itself, this will handsomely carry on the Swift legacy. Looks good as a package but personally, it has a downright terrible side profile. Guess only Maruti can sell two blockbusters alongside: Swift and Baleno. The "modernness" of the new Swift raises the question on how and why one would chose one over the other. Excellent review Aditya and Moralfiber . Nothing can beat Team BHP official reviews. I was not a fan of swift’s design right from its first gen, but this one is different, attractive, smart and sporty, has made me drool over time and again trying to look from every angle and it looks good from all angles. The rear door handle placement is unconventional and not very functional but still does not take away anything in the looks department. Only downside would be the flimsy built, safety ratings and rattles which Aditya mentions had already come up during their review. Great Review! I have recently bought the Petrol Vxi AMT variant. Have been trying to pen down the intial ownership, but guess that will take some more tweaking. However, on a steep incline (e.g. climbing the not so well designed parking alleys at Malls/Hospitals), the AMT does struggle to choose between 1st and 2nd gear. It basically tries to up shift to 2nd and then again down shifts (to makeup for the loss in torque). The workaround that I am using as of now is to shift to Manual and retain the desired gear. That said, driving in City traffic is very very relaxing. Till now, have not found any jerks or unexpected "bouncing forward" behavior. On the ground clearance part, 163 mm does not look good on paper. However, the car so far has not "bottomed out" on any speed breakers yet in Bangalore (which has tons of unscientifically created ones). In fact, there is one in our apartment's parking exit (it was created to prevent road water (during rains) from entering the apartment), which got me very worried. However, the swift was able to cross it without any incidents. On the fuel efficiency front, I am getting around 13.4 (have driven around 500 kms in Bangalore City traffic). Last edited by TSEA : 19th April 2018 at 14:51. Fantastic & most awaited review since the Car was launched. Rating this review 5-stars. Its perfectly detailed. When comparing with outgoing Swift, I feel new one has lost quite a lot of its charm, its USPs. That wont deter sales of the car but still being an owner of previous gen, I felt new one has just lost some character. 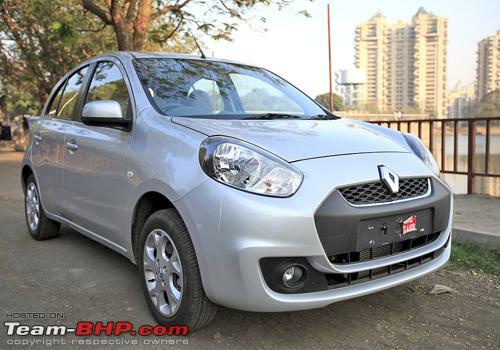 And talking of design the front end has uncanny similarity with the Renault Pulse.Especially the air dam, which is a turn off. The toothed grill of previous gen Swift did offer it some character, and the new one's plain jane horizontal slats makes it pretty boring to look at. The lower variants are very undertired to its size, even the 185 section on the alloy wheel version feels puny, whereas competition is offering 16inch 195 section tires. I'm little concerned that the ride quality of the All new Swift is not that great when compared to its predecessors. I was under the impression that my 2016 Baleno (after full suspension replacement) has the worst ride quality. The new Swift looks smart and the feature list makes it a sensible choice in B2 segment. Maruti priced it sensibly and given importance to safety (Air Bags and ABS as standard). Last edited by Asish_VK : 19th April 2018 at 15:33. Fantastic review. As a Swift vdi owner, I used to love the driving dynamics and looks of the car. 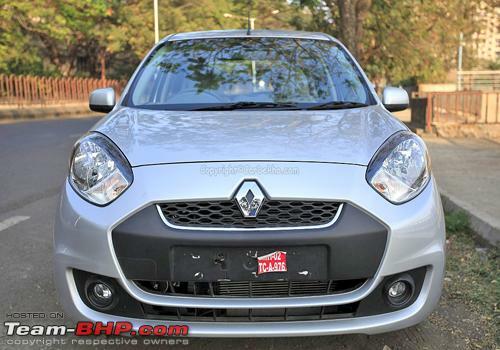 I love the new Swift front grille too, but not a fan of the rear and the side. Absolutely hate the rear door handle placement. Also, wanted to clarify if the older Swift really had a 42 liter diesel tank. Maybe I'm wrong, but I think the capacity was 37 liters there as well. My Swift is getting a bit old and weary and I did contemplate upgrading to the new Swift. Did'nt like the cramped entry into the rear, I think they've reduced the overall gap in the rear, so thats a turn off. Secondly, the quality of the interiors are still dated, granted they're better than my older car, but not in the league of modern cars. Also, disliked the power delivery of the new diesel car. It seems to have lost the punchy nature of the older generation and how. Coupled with all the negatives listed above, I also did not get a feeling of safety in the car, and Maruti is refusing to make public the crash test results, inspite of repeated reminders from my end. Hence, I'm looking outside the Maruti stable. Finally the review is out ! Very detailed and comprehensive. It concurs most of the points I felt during the test drive of the Petrol variant. It was a shocker to read that the 700kms done swift already has rattles, while my 70,000kms done Fiat does not have a single squeak. Talk about fit and finish !! 3 actually if we add the dzire to the list. Now choosing among them gets more difficult. The 8 lakh+ asking price straddling the thousands that tops up at the dzire zxi+ adds to the confusion IMHO. I was almost settled on the Swift zxi+ but the dzire seems more enticing now even with the beige interiors and all. Hopefully the baleno facelift arrives by next year with a 1.5 l petrol to help me decide.. The review is 5 star material as always, a big thanks for the effort that goes into collating such a comprehensive report. My first impression of ride quality of the new swift was not too good. I even had second thoughts regarding my choice. But the first visit to a petrol pump on day 2 of ownership fixed the issue. Tyres were inflated to 47psi !!! Down to 30 psi and things were far far better. BTW my swift petrol manual is returning about 15Km/L in city driving. Also the ground clearance seems OK as never faced a problem of scraping of the under-body though my locality has some pretty nasty speed breakers. Last edited by risham : 19th April 2018 at 17:37. There are a few feature deletions in "V" variants vis-a-vis outgoing car like Fog Lamps (front and rear), electric folding ORVM, adjustable rear headrests and split folding rear seats. However, new one gets ABS, dual airbags, ISOFIX and height adjustable driver's seat. Just for reference, my 2010 Wagon R LXi CNG had adjustable rear headrests, Maruti shouldn't have removed it from V trim. Another thing I observed is fog lamp bulb, my 2015 Swift VXi has H8 35W but this new model has H16 19W available in Z and Z+ variants. A similar change was observed in Innova also, my 2012 Innova has 55W fog lamps, new one has 19W. This might be due to LED projector lights which are better than reflector setup. Even the Rear fog light in outgoing Swift is 21W, dont know why Maruti removed the rear fog lamp. Both the alloys look strikingly good in my view while Swift still looks good. Kudos to Maruti for offering ABS as standard, the only real weakness I find in my car is poor braking, just not confidence inspiring. I feel frontal visibility has improved over the outgoing car due to low dashboard, helpful in urban driving and in tight parking spots. Last edited by aaggoswami : 19th April 2018 at 17:39. A great review indeed. You have literally covered bumper to bumper. I have always been a fan of the official reviews and this one has carried the legacy ahead. 1. Ride: The suspension of the swift is definitely tuned for handling and ride is a compromise. However, I drove the car for a brief period of time in the city speeds with 4 people on board. There was a significant difference in the ride of the car. Just a doubt, is the weight of the car not sufficient to actuate the suspension? When four people were there the ride was close to pliant. Please share your views on this. 2. Headlamp: If the LED projectors are an expensive affair, why not give halogen projectors? The regular halogen reflector set up robs of more than 50% of the looks when viewed from the front (IMO). It looks so ordinary without the projector unit. 3. The Shoes: 185 section tyres should have been standard (IMO). This would have just added another 5K (retail price difference 165/80 R14 and 185/65 R15) to the cost of the car. Maruti could have even passed on the cost to the customers to pay. In fact, Maruti would be having better enterprise deals with Bridgestone that the price gap would've been much less. The 165 tyres are both a safety hazard and the car looks like a body builder who bunks the gym on leg day! Last edited by theMAG : 19th April 2018 at 22:09. Reason: Back-back posts merged. Please EDIT moving forward. Swift and Baleno are too closely priced. In terms of EMI payment, I don't think the difference for both will be much. And I think Baleno is worth the extra few hundred or thousand bucks each month. Also, Swift AT should have come with CVT. IMHO, AMT is yet to reach that level of finesse to justify its existence in a Swift or similar range car.